Many people love classic design, but old yachts, cars and aircraft often come with inevitable issues in terms of performance and comfort, not to mention a never-ending maintenance list. The modern classic offers an alternative to owning a classic superyacht, drawing inspiration from the magnificent lines of yachts from the first half of the 20th century, and yet concealing modernity beneath the waterline and within. 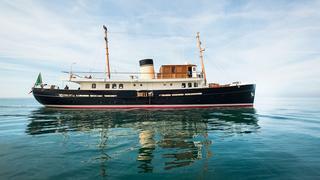 We round up some of the best modern classic yachts in the world... It is not just the name of the 24 metre Livingstone that recalls a bygone era - this steel-hulled cruiser from Hartman Yachts oozes 1930s charm with a canoe stern and a decorative aluminium funnel. However, these classic flourishes belie her high-tech equipment, such as an extendable passarelle that can emerge from the beautifully curved transom in a matter of seconds. It is not just the name of the 24 metre Livingstone that recalls a bygone era - this steel-hulled cruiser from Hartman Yachts oozes 1930s charm with a canoe stern and a decorative aluminium funnel. However, these classic flourishes belie her high-tech equipment, such as an extendable passarelle that can emerge from the beautifully curved transom in a matter of seconds. The massive modern classic Nero stretches more than 90 metres in length. 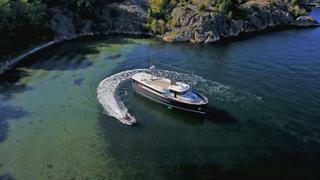 Built in China by Corsair Yachts, her owner was inspired by J.P. Morgan's Corsair yachts from the 1930s. An apt replica, she resembles a small, classic cruise liner – with a smoke stack included. 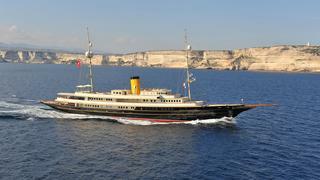 Accommodating 12 guests, Nero is one of the most expensive charter yachts. Superyacht Nero is available for charter in the Mediterranean and the Caribbean, with a talented chef on board who has received some bizarre requests in his time. The massive modern classic Nero stretches more than 90 metres in length. Built in China by Corsair Yachts, her owner was inspired by J.P. Morgan's Corsair yachts from the 1930s. An apt replica, she resembles a small, classic cruise liner – with a smoke stack included. 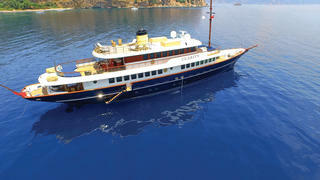 Accommodating 12 guests, Nero is one of the most expensive charter yachts. Superyacht Nero is available for charter in the Mediterranean and the Caribbean, with a talented chef on board who has received some bizarre requests in his time. She may look like she was born in a different era, but the 48.7 metre yacht Clarity was launched by Turkish yard Bilgin Yachts as recently as 2015. Styled in-house, this modern classic was based on a simple but ambitious premise: to build a yacht with a design that will last forever. Her full-displacement hull has a bilge keel and bulbous bow for all-ocean seakeeping, while modest 707hp Caterpillar engines yield a serene cruising speed of around 10 knots befitting of Clarity’s graceful appearance. She may look like she was born in a different era, but the 48.7 metre yacht Clarity was launched by Turkish yard Bilgin Yachts as recently as 2015. Styled in-house, this modern classic was based on a simple but ambitious premise: to build a yacht with a design that will last forever. Her full-displacement hull has a bilge keel and bulbous bow for all-ocean seakeeping, while modest 707hp Caterpillar engines yield a serene cruising speed of around 10 knots befitting of Clarity’s graceful appearance. The 38.8 metre Truly Classic Atalante was launched by Claasen in 2015 and combines retro good looks and modern performance. She features design from renowned modern classic designer Andre Hoek, who takes his inspiration from famous designers of old, such as William Fife, Charles Nicholson and Nathanael Herreshoff. Atalante was built for the owner of a 27.5 metre Truly Classic of the same name, who enjoyed the smaller version so much that he ordered a larger, faster version. The 28.9 metre Ardis II was built by De Cesari for superyacht and jewellery house owner Carlo Traglio. 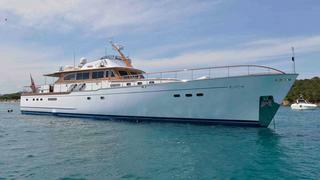 The mahogany motor yacht can often be seen moored in Porto Cervo, Sardinia. 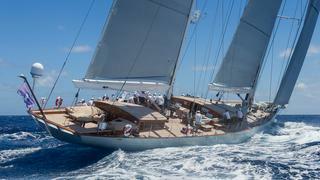 Traglio spent much of his childhood on the classic 50 metre schooner Xarifa, before owning the Perini Navi 80 yacht Malizia. His experience of classic yachts acted as inspiration for building Ardis II, which can accommodate up to eight guests in four cabins. She is fitted with modern MTU diesel engines and is capable of 25 knots. The 28.9 metre Ardis II was built by De Cesari for superyacht and jewellery house owner Carlo Traglio. The mahogany motor yacht can often be seen moored in Porto Cervo, Sardinia. Traglio spent much of his childhood on the classic 50 metre schooner Xarifa, before owning the Perini Navi 80 yacht Malizia. His experience of classic yachts acted as inspiration for building Ardis II, which can accommodate up to eight guests in four cabins. She is fitted with modern MTU diesel engines and is capable of 25 knots. Launched in 2015 by Rossinavi, the 40 metre motor yacht Taransay was built to replicate yachts of the early 1930s. 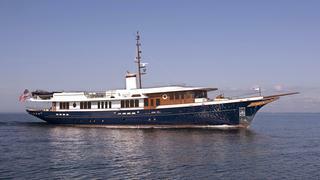 Taransay's owner is said to have been inspired to build a modern classic yacht after chartering the real classic Ocean Glory, launched in 1935. Rossinavi married Taransay's classic styling with modern propulsion – two Caterpillar C18 Acert engines deliver a top speed of 14 knots, and she has a range of 3,500 nautical miles at 10 knots. She also has spacious interiors and deck spaces thanks to a roomy 7.6 metre beam. Launched in 2015 by Rossinavi, the 40 metre motor yacht Taransay was built to replicate yachts of the early 1930s. Taransay's owner is said to have been inspired to build a modern classic yacht after chartering the real classic Ocean Glory, launched in 1935. Rossinavi married Taransay's classic styling with modern propulsion – two Caterpillar C18 Acert engines deliver a top speed of 14 knots, and she has a range of 3,500 nautical miles at 10 knots. She also has spacious interiors and deck spaces thanks to a roomy 7.6 metre beam. Eleonora E is an exact replica of the schooner Westward and an excellent example of a modern classic paying tribute to the original. She was built at the GraafShip yard in the Netherlands and was launched in March 2000. Since then, Eleonora E — currently available for charter — has successfully participated in a number of classic sailing regattas. The 46 metre Sycara IV was a show-stopper when she was launched by Burger in 2009, displaying the US builder's diversity as it waded into retro yacht waters. With exteriors by Bruce King and interiors by Ken Freivokh and Craig Beale, the fantail stern yacht makes you do a double take as she could easily fit in alongside classic Trumpys. But this modern classic has a shallow draft and was designed for cruising the Bahamas and the Great Lakes in style. Sycara IV has modern touches with a spacious on-deck master stateroom, telescoping bowsprit and corrosion resistant aluminium hull. The 46 metre Sycara IV was a show-stopper when she was launched by Burger in 2009, displaying the US builder's diversity as it waded into retro yacht waters. With exteriors by Bruce King and interiors by Ken Freivokh and Craig Beale, the fantail stern yacht makes you do a double take as she could easily fit in alongside classic Trumpys. But this modern classic has a shallow draft and was designed for cruising the Bahamas and the Great Lakes in style. Sycara IV has modern touches with a spacious on-deck master stateroom, telescoping bowsprit and corrosion resistant aluminium hull. This modern classic yacht is a head turner on the racecourse, blending speed and style thanks to her highly varnished wooden hull. 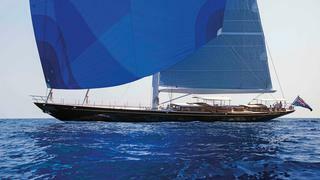 The 27.43 metre Tempus Fugit, from Arkin Pruva, was designed by Rob Humphreys to pay homage to J Class yachts, but she is beamier, offering more comfortable living accommodations below and in the cockpit during races. 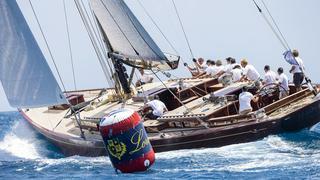 And race she does — Tempus Fugit was a surprise contender at regattas when she came onto the scene, holding her own against classic yachts and modern carbon crafts as well. This modern classic yacht is a head turner on the racecourse, blending speed and style thanks to her highly varnished wooden hull. The 27.43 metre Tempus Fugit, from Arkin Pruva, was designed by Rob Humphreys to pay homage to J Class yachts, but she is beamier, offering more comfortable living accommodations below and in the cockpit during races. And race she does — Tempus Fugit was a surprise contender at regattas when she came onto the scene, holding her own against classic yachts and modern carbon crafts as well. 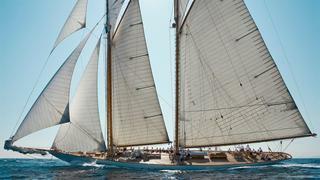 The beautiful, modern classic ketch Elfje is owned by philanthropist Wendy Schmidt. Schmidt had a very hands-on role in designing Elfje with Hoek Naval Architects and is proud of its environmental credentials, from its racing design to sustainable materials. Expect to hear a lot more about Elfje, a sailing superyacht of the ages, as she's been busy on the racecourse since her launch. 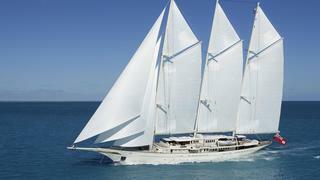 The 90 metre Athena, built by Royal Huisman, is inspired by classic schooner yachts, but has a modern twist. This modernity is appreciated in Athena's sail plan and rig, which benefits from in-mast and in-boom furling. The three-masted schooner Athena flies some 2,500 square metres of sail, which can be set and stowed at just a press of a button(s) thanks to the 55 Rondal captive winches on board. The iconic Athena's imposing size is well divided by her designer Pieter Beeldsnijder, who broke up massive interior spaces into welcoming living areas. The 90 metre Athena, built by Royal Huisman, is inspired by classic schooner yachts, but has a modern twist. This modernity is appreciated in Athena's sail plan and rig, which benefits from in-mast and in-boom furling. The three-masted schooner Athena flies some 2,500 square metres of sail, which can be set and stowed at just a press of a button(s) thanks to the 55 Rondal captive winches on board. The iconic Athena's imposing size is well divided by her designer Pieter Beeldsnijder, who broke up massive interior spaces into welcoming living areas.